When the Sheffield Strachan-bodied Leyland Tigers were discussed in a previous posting there was mention of a couple of batches bearing Cawood bodies. 103 was one of five for the Joint Committee (B fleet) another five were delivered to the Corporation (A fleet). I think this is parked outside Leadmill garage, waiting its turn for the washer and refuelling as was the norm at Leadmill. If my memory serves me well, the 29 at that time was for Ringinglow, which was a Leadmill route. Behind is TD5/Cravens H55R of 1937 which by the time of the pic was an instruction vehicle. This picture appears in Sheffield Transport by Chas.C. Hall, though I bought mine from RHG Simpson. No. 27 was the Ringinglow route Les. No.29 was a City (Fitzalan Square) to Blackburn (Shardlow’s Works) and was jointly operated with Rotherham CT Dept. Another example of a ‘B’ fleet bus on a Corporation ‘A’ route. Would Leadmill garage have that many ‘B’ routes other than Chesterfield via Dronfield and Holmesfield? I believe that the 29 to Blackburn (not the one in Lancashire!) required single deck buses because of a low railway bridge just off Ecclesfield Road. Rotherham used to use centre entrance Bristol single decks for their contribution to the service. These PS1’s were allocated to Townhead Street, and I’m pretty sure that’s where this picture is actually taken, on the parking area at the side of the garage where a lot of Townhead’s single-deck allocation were frequently parked, along with several of the training buses. The workers 29 service was, I believe, originally a Townhead duty that eventually ended up being the responsibility of East Bank. I rather think the location is Tenter st where single deckers were parked alongside the garage wall as was the norm. Thanks for the info everyone. Leadmill had several B routes Andrew. My home route was the 83 to Birley. Holmesfield (86??) was another, 57 Bradway another. Happy New Year to you all. Interesting that 29 was an "A" route, although it ran outside the city boundary, likewise 69 to Rotherham. I think this was because these ran direct from the city into Rotherham Corporation’s area and did not enter the "B" area. Les, I’m sure it was a typo, but the 59 was the Bradway route. Putting B fleet buses on A fleet routes was not unusual as they were jointly owned and could be deployed as required – if not required on B duties. Indeed, at times of heavy transport usage, A fleet buses would be used on B and, sometimes, C fleet routes – especially Easter and Whit Bank Holidays. B and C fleets were for Railway (rural) routes outside the city area. 29 and 69 were joint agreements with a neighbouring (operating) authority rather than a route taken over with the railway agreement. Nobody seems to have asked the vital question.Who were Cawood and where did they come from? Did they build other bodies? David, As a boy I could remember every single route. However there have been many changes since, and I’ve moved around the country a lot. Somewhere along the way I lost my fifties and sixties timetables so depend a lot on memory. (Now what was I saying?) Oh yes, what you say is absolutely correct. I’ve been at Bakewell on a Bank Holiday weekend and seen buses from all three fleets arriving there. My home route, 83 Birley, was a B route but now and again would have one of the 700 series Regents on there. At that time the 95 to Intake was covered by the 700/800 Regents with an odd appearance of a 1200 series Regent. Prior to moving away with my job in 1967 I never ever saw a Leyland on the 95 though I have seen pictures of this since then. 95 was also a Leadmill route. Phillip, there is some explanation of Cawood in another article (about Sheffield’s Strachan bodies I think). Dave Careless and David Grant comment on Townhead Street and Tenter Street garages. These were one over the other and in Sheffield’s tram days Tenter Street housed trams. "Sheffield Transport" by Chas Hall shows a line up of the superb Roberts trams on the last day of tram operation by the city. If I remember correctly from my student days in the 60s, all five Sheffield depots in operation then had a mix of A and B routes, but the C routes were concentrated at East Bank and Townhead Street. Bramall Lane depot was before my time in Sheffield so I don’t know the position there. Naturally this wasn’t part of my university course and I had to work it out for myself! There was nothing quite as fascinating as a bus garage when you were a schoolboy bus enthusiast. Being a Rotherham lad, I spent many hours peering through the railings outside the Corporation depot at Rawmarsh Road, but stumbling across one in Sheffield that had trams in the basement and buses on top was truly mind boggling. I’d never scribbled numbers down quite that fast before! All the Sheffield garages were something special back in those days; Leadmill Road, with the castle-like turrets at each each side of what had been the main doorway when it was Shoreham Street tram depot, was a fascinating building, and the then modern garages at Herries Road and Greenland Road, although perhaps not as architecturally pleasing, were truly a sight to behold late at night, with lights blazing and the forecourts stuffed full of AEC’s and Leyland’s in that remarkable Sheffield livery. Talk about nirvana. All these years later, in Canada, I have a purpose-built glass-fronted display cabinet in the lounge, full of EFE’s and the like on several shelves. Granted it’s only a display cabinet, but after dark, when I plug in the subdued fluorescent lighting in it, it immediately ceases to be a model cabinet and magically becomes Herries Road garage in 1964!! Les. Like you, I am baffled – having only memories of AECs on the 95. [Presumably we have both seen the same picture of a PD2/Weymann.] My maternal grandmother lived on Woodhouse Road and the 95 was in weekly use! I think Bramhall Lane had Chesterfields before Leadmill – they certainly had the 13** Regent Vs that ran them. I "left" in 1971, but still have brothers, aunts and uncles whom I visit – as I did last week. I was day-dreaming of Regent IIIs and Chesterfield PD2s passing by my hotel on Chesterfield Road (in the grounds of what was once Jordanthorpe School). Well I am getting old and nostalgic….. Does anyone know when Lincs Road Car started their joint service 85 with SJOC between Sheffield and Gainsborough by any chance ? Was it late 60`s ? Visiting Sheffield to see relatives in the early sixties , I was amazed with the variety in the bus station . Blue Crossley training buses, new Atlanteans ( wow ! ) lots of different types of AECs – nice livery and red wheels . Dead classy I thought ! The transfer of certain ex Sheffield ‘C’ routes including the 85 was made on 1st January 1970, exactly 43 years ago! Is this an urban myth? I was once told that when the Torys were in power on the City Council the wheels were painted blue and when Labour was in power the wheels were painted red!!! I’ve read this but apparently blue wheels first appeared on the 1966 delivery of Atlanteans when Labour controlled the City Council. The change back to red occurred because no doubt someone decided they looked better. Service 85 became jointly operated by Sheffield Transport, Lincolnshire Road Car and East Midland as part of the disposal of the JOC C fleet, most of which went to the NBC, as you say, 43 years ago. Philip no urban myth, I don’t think there was enough time to paint all of them blue. Better still one of the local golf courses managed to renegotiate it’s lease with the council at that time. Cheers for the info re the 85 . I have seen a few photos of LHs and REs on the route – no MWs though . Some years ago, when the Big Ben’s clock face was being renovated, they found that the black numbers were originally blue. There was some discussion about returning them to blue in the interest of historical accuracy, but Labour objected because it would favour the Tories, so black remained. Childish? Yes! True? Oh, Yes! Although the agreement relating to the sharing-out of "C" services between Sheffield Corporation and NBC came into effect on 01.01.1970 joint operation of the Gainsborough service didn’t start until the 18th – in the interim period four former "C" fleet Leopards were loaned to the Corporation to maintain the service. Thereafter, Sheffield provided one full-day and two part day duties from Greenland Road (generally using AEC Swifts which had been downseated to provide extra luggage capacity), East Midland provided two all-day duties from Worksop depot (generally using Leopards or REs), whilst Lincolnshire provided one all-day duty from its Retford depot (initially using a newly-allocated LH, but replaced the same year by an RE). Lincolnshire closed its Retford depot on 01.05.72, when most duties on the 85 transferred to Gainsborough depot, though a couple of buses were out stationed at East Midlands Retford depot. 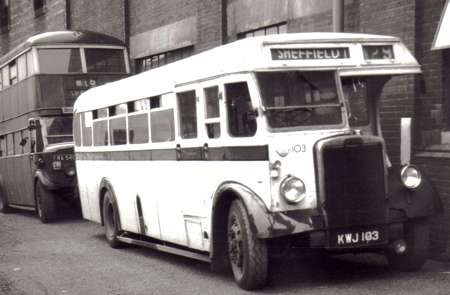 Sheffield continued to outstation one bus at Retford, formerly used on the 85 pre-1970, until the end of April 1972: in recognition of their long service the Retford crew that used to work the 85 were given a duty at East Bank garage which allowed them to run light from Retford to South Anston each morning to pick up service on one of the Dinnington routes to run into Sheffield, work other routes as required, change buses, run back out to South Anston in service, and then light back to Retford – this arrangement ended when the conductor retired, after which the driver travelled to and from Sheffield as a passenger on the 85 to work as a spare driver, until he too retired the following year. Les, I have found my box of time tables and I have a Sheffield 11/63 to 05/64 #182 if you want to know anything just ask. The timetable shows that through passengers on 85 had to change buses at Retford as double-deckers could not work to Gainsborough. In 1969 single-deckers began to run throughout and the 85 was operationally linked to a short A route to Parkway Markets (121). This practice continued after the 85 had become joint, resulting in the odd sight of an East Midland bus working a Sheffield City service "on hire" – but the Lincolnshire bus did not apparently take part. Thanks Philip and Geoff for the extra info – great ! Peter, thanks for the note on timetables – I’ll keep that in mind for my next "starter for 10". A fascinating garage was Eastbank as it had an extensive roof-top parking area which was often used by withdrawn vehicles, each with the Sheffields lettering / insignia and fleet numbers blacked our prior to sale or disposal. I can recall the rather unusual Cawood bodied Leyland PS1’s running out of Pond Street in the early 50’s on the 21 route to Swallownest via Catcliffe and Treeton. I seem to remember they were used on short workings to Treeton on occasion. The very first vehicle to receive blue wheel hubs was No340, Atlantean/Park Royal the Earls Court show vehicle of 1964. The Daimler Fleetline/Park Royals which were delivered that same year had the normal red hubs as did the Neepsend bodied Atlanteans of 1964/5. However, all vehicles delivered during 1966 Atlantean/Park Royal, Atlantean/Neepsend and the Craven bodied Bedford had blue wheel hubs and this was the year in which the Tory party was in charge. Incidentally, No340 was the first in the fleet with blue moquette seats on both decks, the Fleetlines being red/beige on lower deck and red leather upstairs. On the subject of Cawoods, it is worth noting that just after WW2 the Thames Valley company was so desperate to rebuild many of its war-worn fleet that a number of them were sent all the way up to Cawoods, including Harrington-bodied Leyland Tiger TS8 coaches and some of the Tiger TS3 and TS4’s re-purchased after being with the military. Full details are in my History of the Thames Valley Traction. Co. Ltd. 1931-1945 and 1946-1960 volumes.